Moving home closely follows death and divorce as the 3rd most stressful experience everyone dreads. So be careful when you choose and select your Logan to Sydney removalists company. Cost should not be the only measure by which to decide who will shift your prized possessions to a new location. When you let your pocket do the talking, you expose yourself to untold risks if something goes wrong because you decided on a ‘cheap’ company. Experience and professionalism in interstate removals cannot be acquired in a short span of time and need organization to master. This organisation and experience is available with Roadways Furniture Removals. We are the interstate removalists to look for when you want an all-under-one-roof solution. We focus on your need for interstate removals and provide personalised services to each of our clients; We are capable of providing any kind of household removals or backloading services, for moving next door or right across Australia. We have the experience to provide quality interstate removals services because we know the industry inside out. Roadways possesses the necessary affirmative approach backed by knowledge! Quality removal services at justifiable prices is our game! Interstate Removals: We can satisfy any kind of request with practiced perfection. Local Removals: Moving intra-city? You can use our local removals truck service operating in all major cities 7 days a week. Backloading: Whether small or large interstate backloading, we know what it takes and have the means to get the job done. Storage Facilities: Need a pace to leave your stuff safely? No Problem. Vehicle Transport: Spare yourself and your vehicle a long drive. Use our interstate vehicle transport service; bikes or cars, we’ll truck it for you to Sydney without a problem. Piano Removals: Whether it’s a compact living room piano or a concert grand, our specifically designed piano removals equipment for safe interstate piano transport, including other items like pool tables, will serve the purpose. Moving Boxes: We will provide what you need, in sizes and quantities, to hold every last item. Our high quality moving boxes are specifically designed for the removals business. Pre-packing: Spare yourself the pain of packing up your household and let our professionals do it for you. When you need specialized and customised Removalists services from Logan to Sydney at unbeatable rates, Roadways is, without hesitation, your smartest pre-removal move! Call us for a quote today. 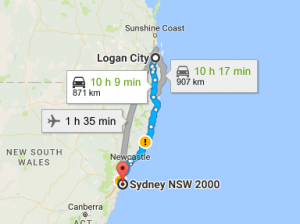 If you need reliable Logan to Sydney removalists, Roadways Removals is ready to get the whole process on the way today!